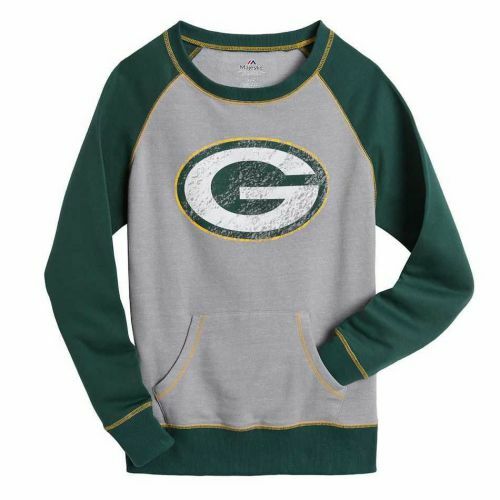 Green Bay Packers women's plus OT Queen Raglan by Majestic has gray body with green sleeves, neckline and ribbed hem with gold accent stitching and front handwarmer pocket and features the Packers logo in distressed screen printing on the front. Available in women's plus sizes 1X, 2X, 3X and 4X. 90% cotton/10% polyester (HERNFL3NU) Majestic Women's Plus is generously sized for full figure women. Service Area: Shawano, Appleton, Stevens Point, Oshkosh, De Pere, Wausau, Menasha, Clintonville, Little Chute, Hortonville, Pulaski and surrounding communities.